Bitcoin Press Release: Cloudways, a leading managed cloud hosting platform established in 2012, is pleased to announce it is now accepting the P2P currency Bitcoin for all customer transactions. Web apps and stores hosted on Cloudways load on average 100% faster due to special optimizations, utilizing the latest in server load balancing technology. Based on the open source peer to peer internet protocol, Bitcoin has gradually become the most preferred alternate currency in the world. The integration of Bitcoin payment gateway further demonstrates Cloudways’ innovative approach and love for their customers: giving users the payment flexibility they desire. 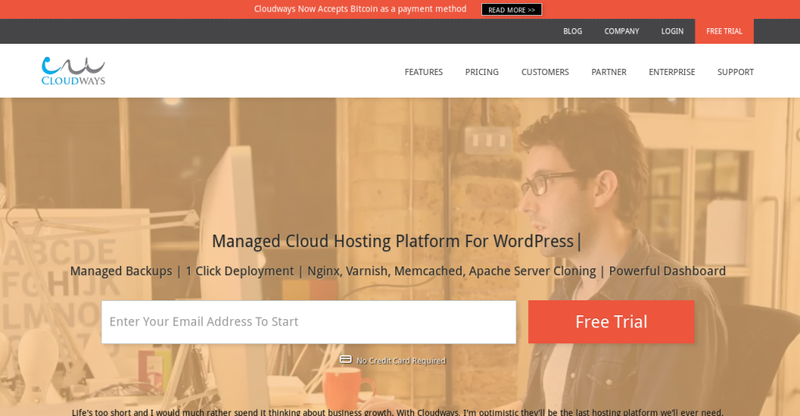 Cloudways now supports MasterCard, PayPal, VISA, and American Express along with the newest addition of Bitcoin for all managed cloud hosting products. Cloudways always ensures that its platform is secure and up to date with the latest OS patches thanks to the auto-update feature of the state-of-the-art cloud console. The console also enables the users to access over 15+ performance-related metrics with a single click. Cloudways’ console has an integrated monitoring mechanism system which generates pictorial reports for the metrics that help users determine how well their web applications are performing. Web apps and stores hosted on Cloudways load 100% faster because of the special optimization formula that utilizes the powers of Varnish, Memcached, Apache and Nginx.After the introduction of Bitcoin, Cloudways continues to show its commitment to serve the needs of its customers and embrace emerging technologies. Cloudways is a Europe-based managed cloud hosting provider founded in 2012 by CTO Pere Hospital. With over 1500+ clients under the umbrella, Cloudways is one of the leading cloud-hosting providers in the world that offers a completely flexible, hassle-free hosting solution on the most trusted Cloud Infrastructure providers. Find out more by visiting us at Cloudways.